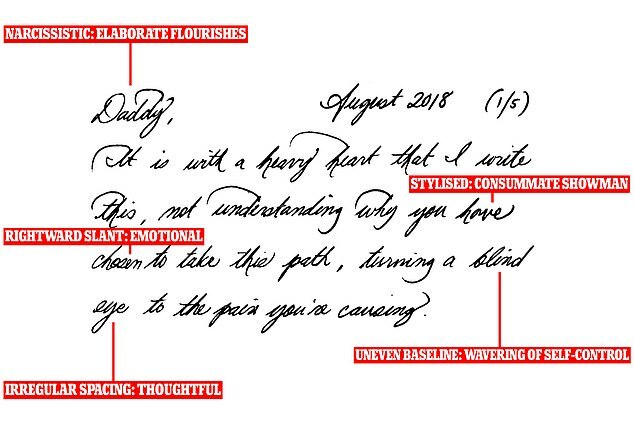 Handwriting experts have analysed a letter sent by the Duchess of Sussex to her estranged father shortly after her wedding to reveal the insights it gives into her character. 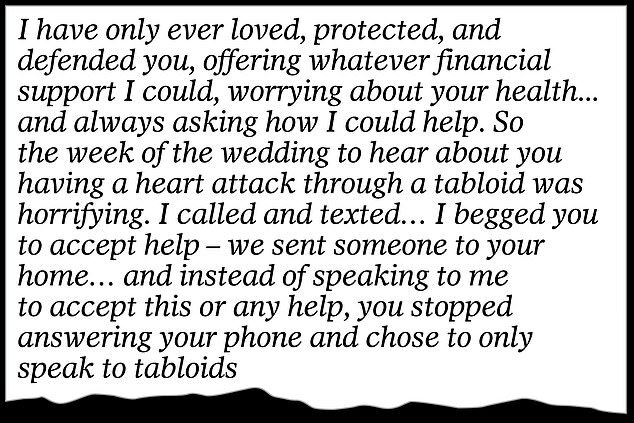 The bombshell five-page letter, sent in August last year, saw Meghan accuse Thomas Markle of breaking her heart ‘into a million pieces’ by giving interviews to the press, fabricating stories and attacking her new husband. Today the UK's leading handwriting expert Emma Bache claimed the 'highly-stylised' letter suggested Meghan was 'ultra cautious' but also a 'showman and a narcissist'. She told MailOnline: 'Meghan shows a highly stylised and slow handwriting. She is ultra cautious, is well aware that the world has their eyes on her and that is just how she likes it. Bache continued to analyse other stylistic features of the letter that could give an eye into Meghan's mind. 'The pressure of the pen is strong - she is physically and sensually as well as materially motivated,' she said. 'The somewhat incongruous and visually dominating leftward upper zone flourishes appear to be tacked on - this is the 21st Century female equivalent of the Dandy, the fop or indeed the showman - and yes the narcissist. 'There are circles within circles in the smaller letters which show her secrecy and unwillingness to reveal her true inner thoughts . Tracey Trussell, a consultant graphologist at Handright, also offered an analysis of the letter. She warned that not being able to handle the original pages made it difficult to make an exact assessment of the handwriting pressure - a key indicator of the writer's feelings - but said it still contained several insights. She told MailOnline: 'Meghan's handwriting is very stylised, revealing her perfectionist streak and desire to hide her true feelings under wraps. 'However, there are other clues. The whole piece of writing has clockwork regularity, and the rhythm is stilted and contrived, which shows how much self-discipline Meghan exerts to keep her emotions and actions under control, so she doesn't do or say the wrong thing. 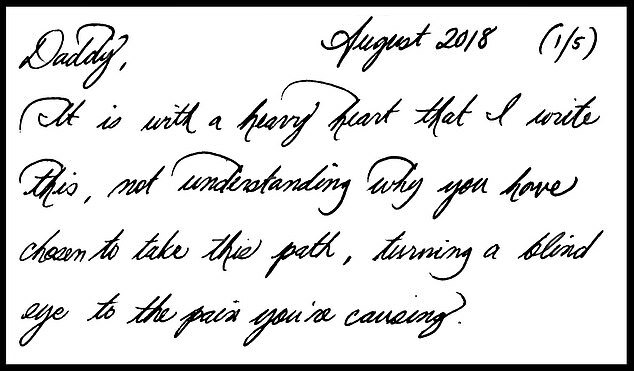 'There are also many starting and covering strokes at the beginning of words - in the vertical axis (seen in the thickness of letters) - which also tells us how much thought she has given to writing this letter, and how hard she was trying to say the right thing and be the strong person. Handwriting slant can also offer an impression of the writer's character, Trussell said. 'Her emotional barometer (seen in the handwriting slant) is set to the right, which means that emotional responsiveness is high - Meghan wants to be friendly and cooperative, she wants to communicate and express herself. 'Also, the spacing of the words is tellingly quite wide and irregular, which also tells us that she gave great thought and consideration to the content of what she's saying, to the extent that it was naturally causing her to feel quite a bit of anxiety. This matter is clearly affecting Meghan deeply. Trussell also highlighted the embellishments in Meghan's handwriting, including the strokes that sweep across the tops of words. She said: 'They look like little protective umbrellas, giving further credence to her deep feelings on the matter. 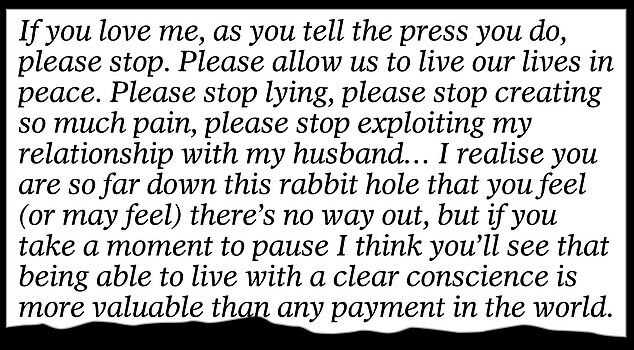 In the letter Meghan admonishes her father, in anguished tones, for siding with her half-sister Samantha – who has attacked her in the press – while she ‘silently suffered at the hand of her vicious lies’. She also accuses her father of snubbing her and Prince Harry’s offers to help when he pulled out of attending their wedding following two heart attacks and accuses him of being ungrateful for money she has given him. The former award-winning Hollywood lighting director, who now lives in Mexico, said that he never intended to make the handwritten missive public ‘out of respect for Meghan’ – but says he has been forced to do so now because its contents have been falsely portrayed. Contrary to claims made by the Duchess’s friends, he said the letter made no attempt to heal their bitter rift. ‘I thought it would be an olive branch. Instead, it was a dagger to the heart,’ Mr Markle, 74, said last night. He dismissed suggestions he has made no attempt to patch things up since her wedding. He showed this newspaper texts which he says prove he reached out multiple times to his daughter and the son-in-law he has never met. 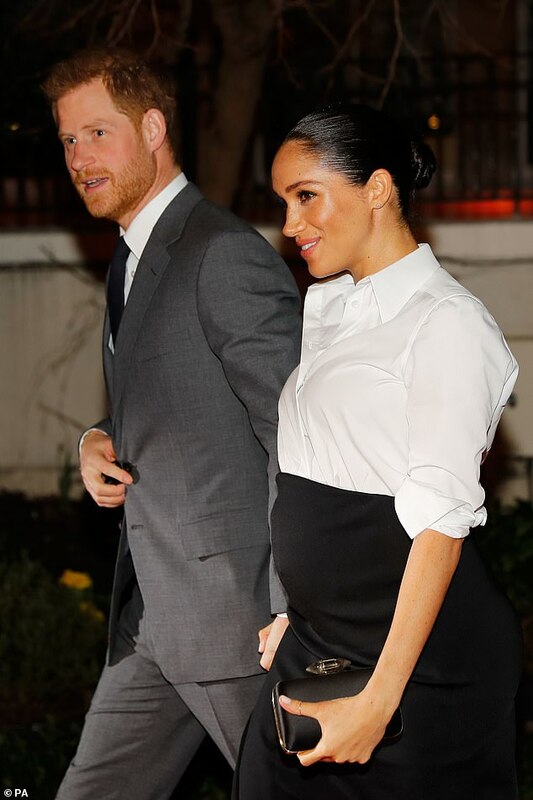 The US magazine People claimed to ‘put the record straight’ over the Duchess’s relationship with her father and criticism of her style as a Royal. It was based on interviews with five friends – at least one of whom is thought to be one of the Duchess’s co-stars in Suits, the legal drama in which she starred for six years. The Duchess came under fire over her apparent decision to allow her confidantes to defend her in the extraordinary interview, without, it is understood, involving Kensington Palace. The palace has refused to comment on whether the magazine’s anonymous sources had co-operated at the direct request of the Duchess or with her tacit approval. Former Buckingham Palace press secretary Dickie Arbiter, who worked for both Prince Charles and the late Diana, Princess of Wales, feared the decision would only exacerbate issues. 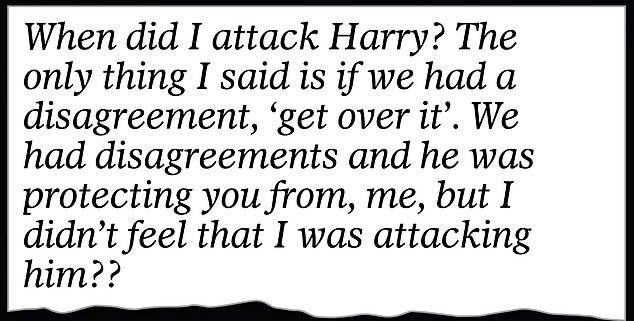 Last night, Mr Markle said it was unfair for his daughter’s friends to use the media to ‘spin a line’ while he was being criticised for ‘giving a handful’ of interviews to the press. In the article last Wednesday, the Duchess’s friends said that she was devastated by his response to the letter, in which he suggested father and daughter pose for press pictures. 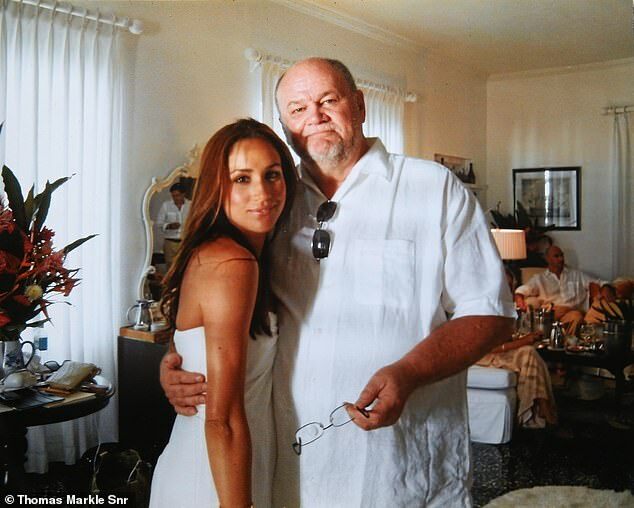 Mr Markle said he had suggested the photo op as a way of showing the world they could be friends again, describing the Duchess’s reading of it as ‘tragic misunderstanding’ he wishes he could put straight. The rift between the Duchess and her father began after The Mail on Sunday revealed, just days before her wedding in May last year, that he had colluded with the paparazzi to stage a series of lucrative photo opportunities. 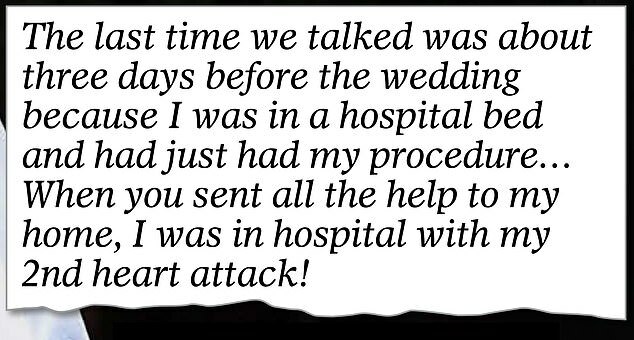 Such was his humiliation that he offered to pull out of attending the Royal Wedding and was later prevented from going after suffering two heart attacks. Since then, he has given a series of damaging interviews in which he has spoken of his dismay at being cast adrift by his daughter and the Royal Family. Emma Bache's first book, Reading Between The Lines, is published by Quercus on the 30th of August 2018.